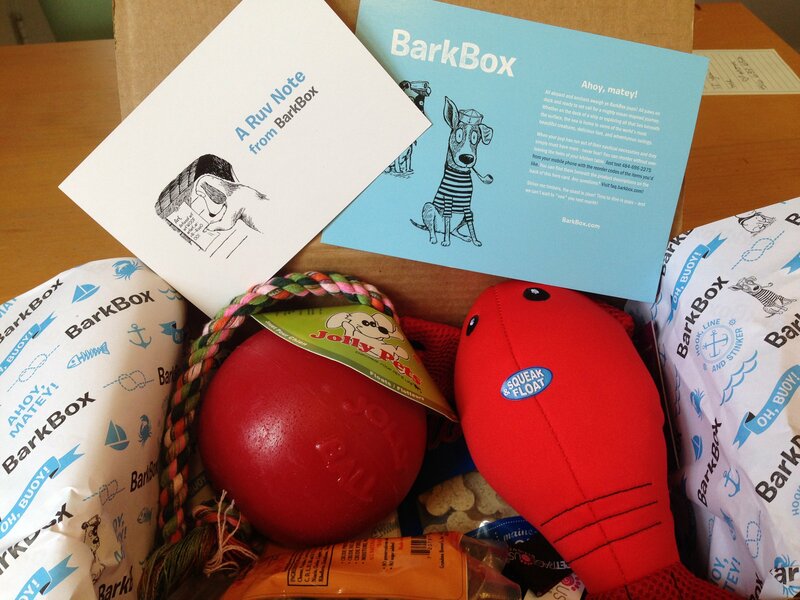 Albie’s August BarkBox came and was greeted with the usual enthusiastic tail wagging and happy sniffs. I’m not sure how he knows it’s for him (I mean, I imagine it’s the smell) but I like to pretend he can read and he sees the doggy logo and is like, Oh thank god, I have been waiting for my monthly treat. Mother, get the scissors and get it open. Shhhhh, I’m not weird. You are. 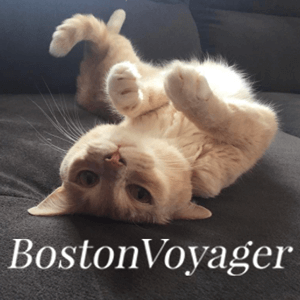 Anyway, we have gotten this subscription for over a year and we love it! 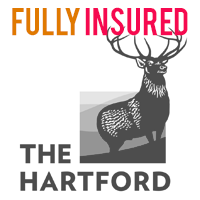 As with most subscription boxes, the longer you sign up for the less it costs. 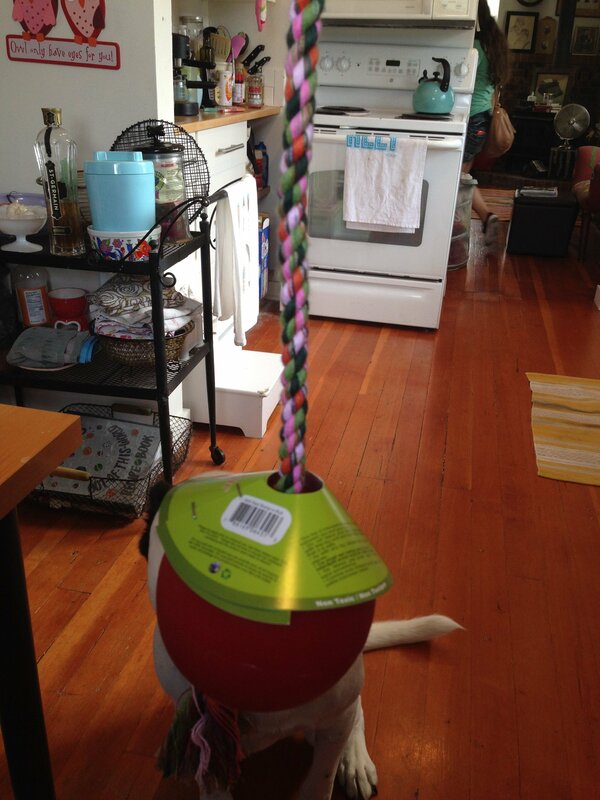 Boxes are customized to your dog’s size and chew-desire. Albie is, as you may know if you have been following, both a giant and a super-heavy chewer. I love this box because some of his all-favorite and most durable toys have come from it, and it stops me from buying treats every time I’m at the store because I know they’re coming each month. How’s that for justifying cost? I think it actually saves me money! So what did he get this month? In order for me to be able to take any pictures I had to get Albie out of the way. I teased him with that big ol’ ball and threw it at him. The theme this month was “Ahoy, matey”. The description card promised a “mighty ocean inspired journey” that will allow your pup to have fun both on land and at sea. A fairly new, and very cool, feature is the ability to text to reorder favorite items. I think that everything should be able to occur through texts. That sounds more dystopian that I intended, but for something like a reorder of a subscription box item a text seems efficient and hassle free! The information cards are really cute, featuring cartoon pups, quality paper, nice font, and clever puns. This box really does feel like a treat for Al and us. 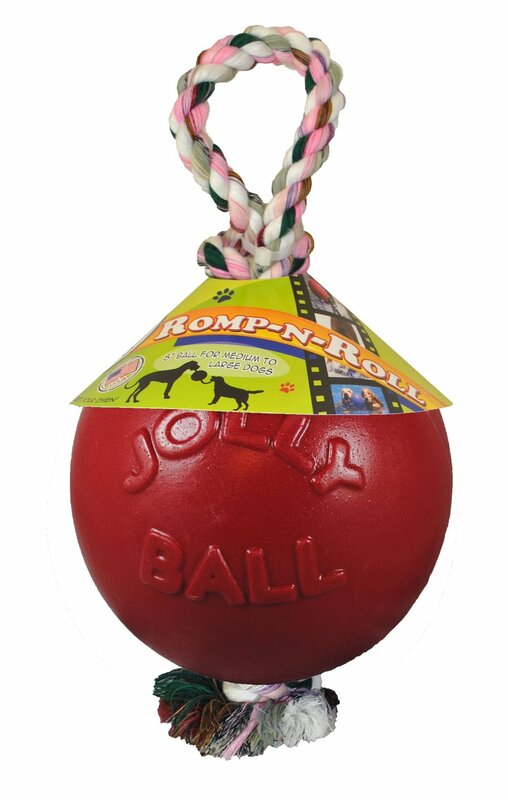 So that big ol’ ball I threw to Al is Jolly Pets Romp and Roll: it’s a combination ball and rope that allows pups to have an exciting playtime. It floats! It has endless possibilities! It is just a red ball now because Albie ate that rope off so quickly! Hahahaha. We don’t hate the player, just the game (or something) so this is not a critique of the toy. Albie is an animal, and I mean that metaphorically not literally as, obviously, he’s an animal. Aren’t we all? His new red ball seems very sturdy. BarkBox says this toy was worth $11 but Amazon has it priced higher. They claim it’s a $19 item but you can have it delivered by drones for $13.29 and free prime shipping. Grandma Bowser’s Cheddar Biscuits He has received this brand before and enjoyed it and these biscuits are no different. They are made in the USA and free of wheat, corn, and soy (because it’s important to give our pets as many food restrictions as we give ourselves!) BarkBox quotes these as an $8 item and the internet agrees! Bocce’s Baker Lobster Roll Treat These yummy looking treats are made with locally-sourced lobster from the coast of Maine and are wheat-free. Organic rye & barley flour, lobster, kelp, and parsley are the only ingredients. Hmmmmm… maybe I could have lobster rolls tonight! (Just kidding.) 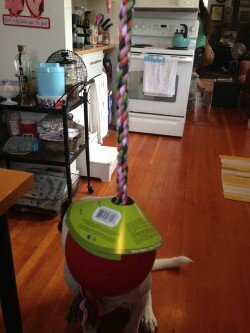 BarkBox and the internet price these at $10 a bag. The final item Albie received was a Pet Rageous Lobster. This came with its own information card. It said that the “Lobster will be happiest when swimming around in some water- whether that be rivers, lakes, a backyard pool, or dare we say… a bathtub! Your pup’s new Lobster friend is not intended to be a chew toy but rather one to be enjoyed during some supervised, watery fun.” Well, Albie doesn’t really understand that anything isn’t intended to be used a chew toy (including a beautiful pair of Madewell flats, eyeglasses, and a coffee table) so this one has stayed in the box. Actually, I have a friend who is expecting a baby so I may just be sending this on her way to use as a bath toy for the new baboo. Albie would demolish it in a good 3 minutes and it sure is cute. 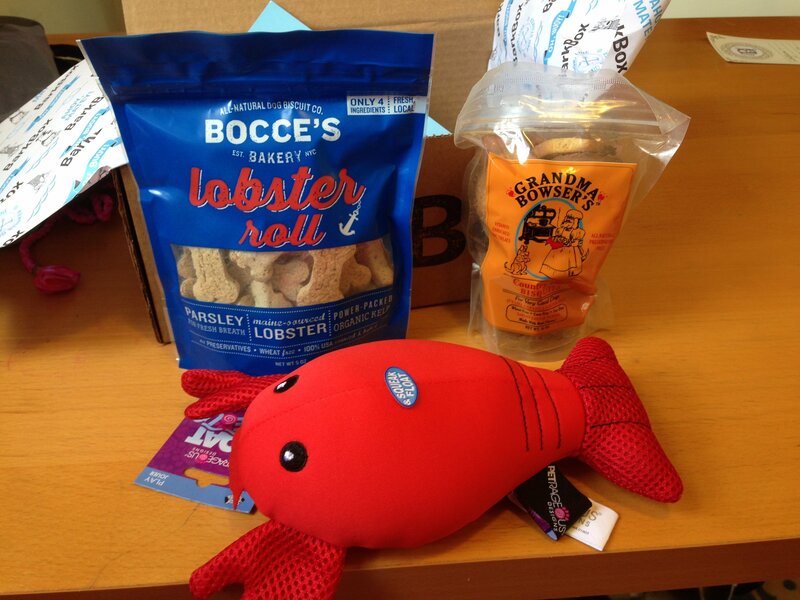 BarkBox said that the lobster is worth $8 and I’m having a hard time finding otherwise, so we can go with that price. All totaled, using the BarkBox prices, even though they seem to err on the lower side, this box had a value of $37, putting it well above the $18/ box I paid at subscription. Also, part of the value comes from not paying for shipping, which if you live in a rural town like I do, where the nearest Target is a 25 minute drive, is really important. Part of the fun, of course, is getting things you don’t see everywhere and the surprise of what you will get. 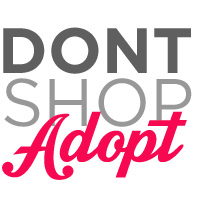 I used to personally subscribe to other boxes for myself, like ipsy, yuzen, and pop sugar, but stopped because the items didn’t always justify the cost as they were things I already had, didn’t need, didn’t want, or could find cheaper online or at Marshalls. I don’t ever feel that way about BarkBox. Worst case scenario, we get a cute toy like the lobster that I just know he will tear up but can regift to a pal. Once in a while we get treats he’s not immediately feeling, but eventually even those get eaten because, like Nicki Minaj, you can tell he’s not missing no meals. (Real talk: that song is dumb. I hope Sir Mix-A-Lot got paid. His song was awesome).